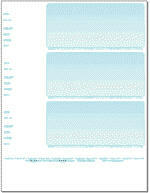 ChecksForms™ are printed on 8.5"x11" (standard letter size) ABA specification 24 lb. paper with perforations and tamperproof ink. Print wallet, business-size, voucher checks or bank drafts. Designed for use with all ChecksNet, , ChexNow!, VersaCheck, Quicken, Money, Peachtree and most other check and draft-making softwares. My Checks WARNING: Check paper from My Checks is NOT compatible with ChecksNet, Quicken, Money, Peachtree and most other check/draft & accounting software. 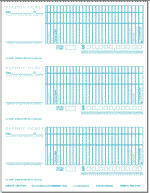 Use ChecksForms & ChecksNet Software with ANY laser, inkjet, bubblejet or 24pin dot matrix printer. If you want checks or bank drafts that meet Federal Reserve standards for magnetic encoding, we can supply MICR toner cartridges for certain lasers printers or you can purchase a complete laser & toner kit from us.